Garsdale is a dale or valley in the south east of Cumbria, England, on the western slopes of the Pennines, between Baugh Fell to the north, and Rise Hill to the south. It is within the Yorkshire Dales National Park. The dale is the valley of the Clough River, which rises on the north eastern slopes of Baugh Fell and flows through Grisedale, the Dale that Died, as Grisedale Beck until it becomes the Clough River at Garsdale Head. The dale forms the civil parish of Garsdale (though the last mile and a half of the course of the Clough river, before its confluence with the Rawthey, is part of the parish of Sedbergh). Small settlements lie along the main Northallerton to Kendal road (the A684) which runs through the dale for 7 miles (11 km), with frequent bridges in the upper part of the dale. The largest settlement, known as “The Street”, lies 6 miles (9.7 km) east of Sedbergh, and 10 miles (16 km) west of Hawes. The other hamlet in Garsdale is Garsdale Head, also called Hawes Junction, the old name for Garsdale railway station, after the former Wensleydale branch on the Settle to Carlisle railway. The population of the parish recorded in the 2001 census was 202, with many of the 150 houses being derelict or used as second homes. Garsdale was historically a part of the West Riding of Yorkshire, and was transferred to Cumbria in 1974. 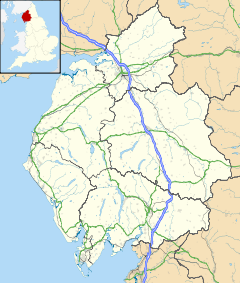 It is now within the South Lakeland local government district, but is still a "Yorkshire Dale" for planning purposes. At Longstone Fell, locally known, and spoken as Langst'n Fell, the A684 road rises to a well-known view-point looking over the Howgill Fells, and the river descends to Danny Bridge, the site of a seventeenth-century mill on the “old road”, before joining the River Rawthey near Sedbergh. The Sedgwick Trail, named after the well-known geologist Adam Sedgwick runs along the Clough from Danny Bridge and highlights rock features along the Dent Fault. The Anglican Church of St John the Baptist, built in 1861 next to the original medieval church, lies 6 miles (9.7 km) from Sedbergh, between The Street and Garsdale Hall, which was once an inn but is now used as a farm store. There are also three Methodist chapels: Low Smithy and Garsdale Street, both in regular use, and Hawes Junction which has occasional special events. The only other public building in Garsdale is the village hall which was formerly the primary school. Garsdale has 18 working farms, most of them amalgamating several of the original smallholdings. Because of the high annual rainfall of up to 100 inches (2,500 mm), crops other than hay and silage are almost impossible, so all farms are stock rearing. Pedigree Swaledale rams occasionally make high prices at Hawes Auction mart. At Garsdale railway station stands a statue of Ruswarp, a collie. Ruswarp belonged to Graham Nuttall, the first Secretary of the Friends of the Settle–Carlisle Line, which was formed to campaign against the proposed closure of the line. Ruswarp's paw print was put on his own objection as a fare-paying passenger. The line was finally saved in 1989. In January 1990 Nuttall and Ruswarp went missing in the Welsh mountains. On 7 April 1990 a lone walker found Nuttall's body, by a mountain stream. Nearby was Ruswarp, so weak that the 14-year-old dog had to be carried off the mountain. He had stayed with his master's body for 11 winter weeks. The Royal Society for the Prevention of Cruelty to Animals awarded Ruswarp their Animal Medallion and collar for 'vigilance' and their Animal Plaque for 'intelligence and courage'. He survived long enough to attend Nuttall's funeral. Thompson, Rev. W (1892). Sedbergh, Garsdale & Dent. Original copy available from Kendal public library. Thompson, William (1910). Sedbergh, Garsdale And Dent: Peeps At The Past History And Present Condition Of Some Picturesque Yorkshire Dales. Kessinger Publishing. ISBN 978-0-548-83166-3. ^ "Parish population 2011". Retrieved 12 June 2015. ^ Illingworth, John. "Ruswarp". Geograph Project. Retrieved 30 March 2011. Wikimedia Commons has media related to Garsdale, Cumbria.